In this tutorial, you will be creating a seven card ensemble using an 8 1/2" x 11" sheet of Whisper White Cardstock that you'll transform into a colorful patterned paper using the Falling Flowers Stamp Set. 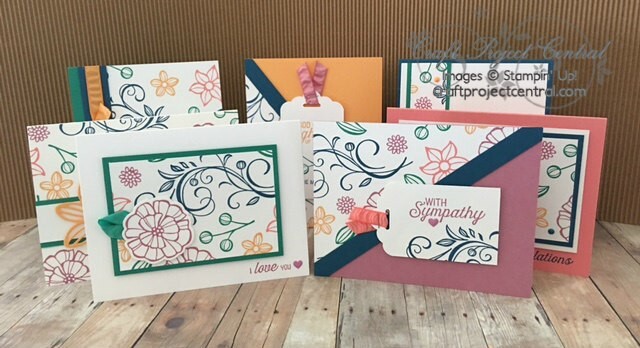 You will learn how to cut that one sheet of patterned cardstock to create seven unique and coordinating cards. Finally, you'll get to package the seven card ensemble into a cute little book box that holds both the cards and the envelopes. You can get the tutorials for this awesome project and all the other January projects at Craft Project Central!